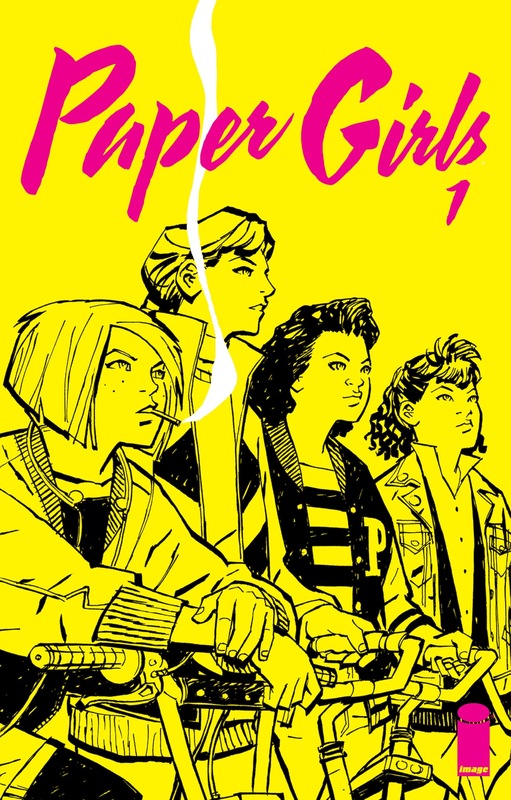 Something a little different, yet familiar..
Paper Girls brings readers back to a simpler time..of paper deliveries, hand-radios, teenage smoking, big jackets, local mysteries. But, this new series does not do with a mockery cheese whiz soaking of tired pop-culture references and music video caricatures. No, it does so with a fantastic look into a what made the 1980’s a truly wonderful form for pre-adult development (being from that time); a sense of curiosity and discovery among friends in the face of danger. To live, be brave and afraid together. Through it all, stronger bonds develop along with a little newfound maturity. Many favorite movies in the 1980’s have those elements shown best through that era: Stand By Me, Monster Squad, Lost Boys, Goonies, E.T, Adventures in Babysitting, The Wizard, Breakfast Club, and more not coming to mind now. Sure, Paper Girls is a comic book set in the 1980’s but it brings that charm and element to the table in a clear, fun fresh pile of print. Much of the issue involves and revolves around the characters of the new series. So far, all pre-teen or possibly early teen girls with distinct personalities, quirks, and dress style. There is a sense of independence among them, that show signs of rebelliousness whether it’s developing colorful language, smoking, and enough reason for breaking into a nearby house. There is also a sense of goodness among them; to stand up to bullies, protect their own, and deliver newspapers. It’s all a great set-up, for what follows. That being said, we have a central mystery in the book. The finding of a few items and strange hooded people leading to something much more, and gives more questions with each answer. Readers can perhaps feel as if they can join Erin, Tiffany, Mac, KJ in speculation. I certainly do, especially with the sci-fi angles brought out so far. And, with Vaughan’s writing on Saga, Ex Machina, and Y the Last Man, I think there will be interesting twists; which will be anything but predictable and boring. 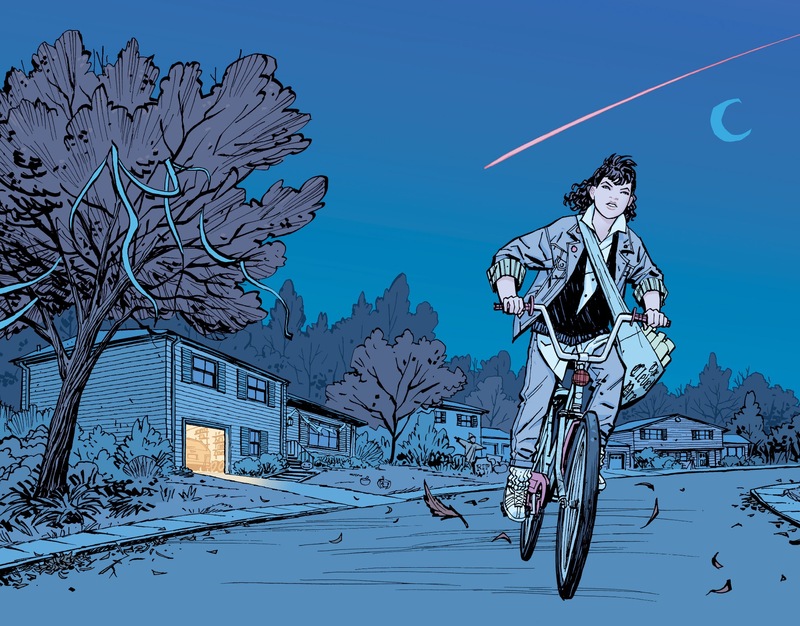 I love the art style of Paper Girls. It’s all much eye-catch with vibrant colors, different font, and well-defined pop-out lines and mood-defining textures. The whole package of colorful classic art, feels perfect for a comic of discovery and otherworldly interest. It puts the escapism into comics, as though the setting is a suburban territory of yesterday..it can still be as fantastic a setting as any alien world as fantastic elements are allowed. Yes to Paper Girls, as the first issue delivery is strong and the intrigue is high. Yet, still beginning with character development and overall pacing. With trust in the writer and awesome art, I feel this will be an overall story well-remembered for fans subscribed and awaiting each fresh delivery.